There are a few unusual beans which my dad has actually conditioned all of us siblings to like. 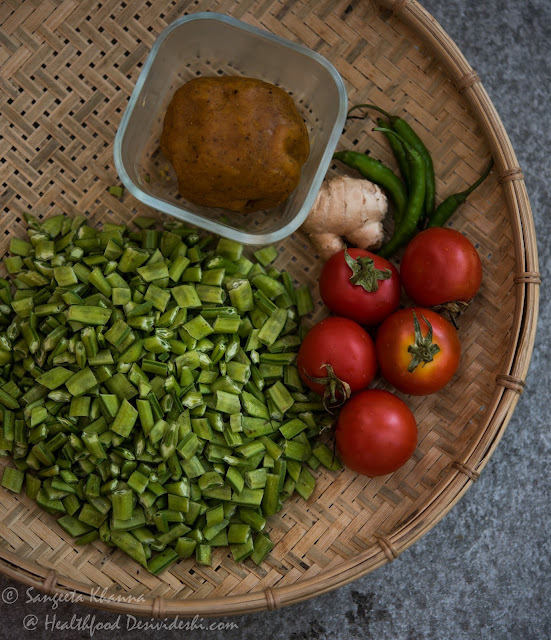 Guar or cluster beans and bakla or fava beans are the ones which nobody seems to like but I do buy them whenever I get to see them in the market. Guar is also known as guwar and this guar dhokli ki subzi is one of my favourite now. Although cook with these beans frequently, I have not posted any recipes apart from this one with bakla. We get good quality guar fali easily here in Delhi and I make many variations cooked with curds, with sesame, with garlic and green chillies etc. Still I keep looking for new recipes as Arvind does not like this vegetable much (only the sesame version he used to like earlier). I asked for a gujrati style recipe from a fellow blogger Parita and she had posted this recipe of guar dhokri last year (I was pestering her so much). It's actually an easy and delicious recipe, made without any garlic and onion. 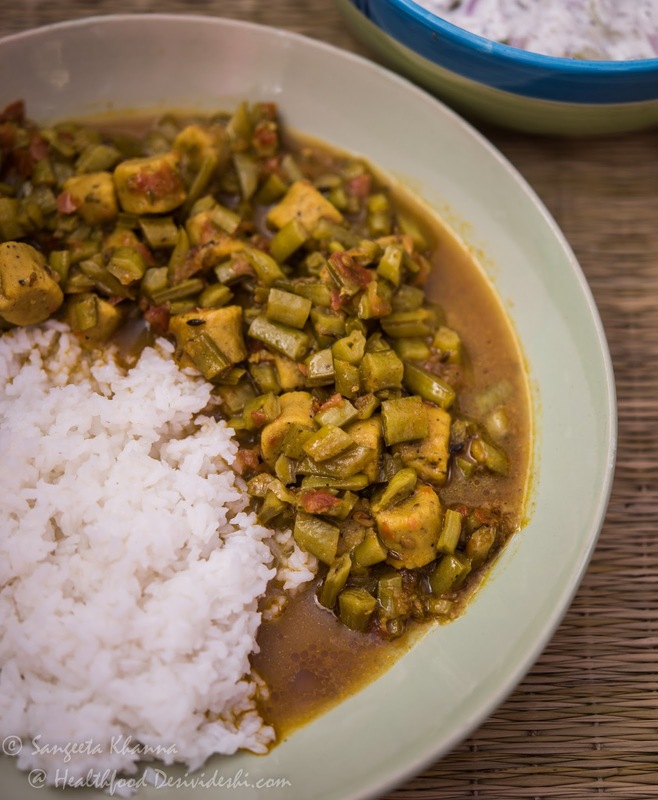 The use of dhoklis, the chick pea dumplings in this curry makes it a keeper recipe. I made a few changes in the recipe to suit our taste, added ginger and tomato puree and the result was very very good, all the guar curries I used to make earlier were dryish in consistency, this one being a gravy curry was great with rice and chapati both. Prepare the dhoklis first (I made them while stir frying the guar but if you cannot handle both the things together it is advisable to make the dhoklis ahead. 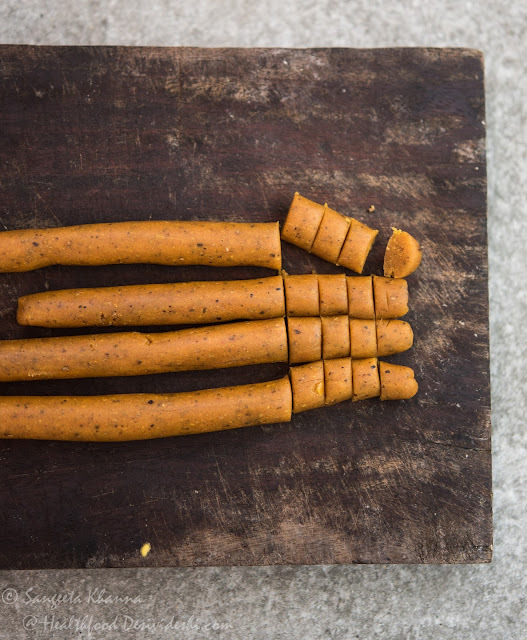 Mix all the ingredients for dhokli and add a little water to make a stiff dough, roll the dough with oiled hands into a sausage like roll and cut thin roundels with a knife. These slices of dough can be shaped into round discs and kept aside, or this step can be done while working on the kadai. Heat mustard oil in a kadai and throw in the crushed asafoetida (I use the crystallized resin form) or the powder. Add the cumin seeds and wait till they crackle, throw in the chopped green chillies and chopped ginger and wait for a couple of seconds..
Now put in all the chopped guar beans and stir fry on medium flame till they look a bit translucent..
Add all the powder spices and salt to taste and stir fry till the spices turn aromatic....takes about 4-5 minutes on low flame . If using more oil for cooking , this step can be done at high flame and takes about 2 minutes. Add the tomato puree and keep stirring for a minute or two. Add enough water (I added about 500 ml) and the prepared dhoklis. Let it boil vigorously, the dumplings fluff up immediately as they have soda bi carb in it. I added 2 crushed dhoklis as suggested by Parita to thicken the gravy. This guar dhokli ki subzi was great with rice as well as chapatis. The steps of the recipe look a little cumbersome but it's really easy as there is no onion garlic to peel and chop and there is no paste to be made. Dhoklis (or gatte) can take some time but if you do it simultaneously it's really a quick recipe. The dhokli was a new addition for me, I make gatte ki subzi and thought it must be like gatte having the same ingredients, but it tastes different when it is cooked differently. Dhoklis complemented very well with the guar and this gravy. Do try this recipe if you don't like guar and want to include it in your daily meals. This is my favourite and gavar is a must.. i do no like the dish if prepared without gavar.. However, the way we make this dish is very very different from this recipe and i will share our version when my aaji makes it next.. she makes the most awesome dal dhokli in the world..
oh Thanks Gauri... i will be waiting for your recipe. We loved this version too. Please post all your guar recipes. I like this vegetable too! Please post all your guar recipes I like this vegetable too. Hi anonymous .... i will post them very soon. Yum! I had dokhlis only in restaurants and would love to make them at home! you make it sound easy! Curry looks very yummy! unusual recipe.... I like this gujju punajabi combination and definatly going to try this! Hi sangeeta, just came across your blog.. your recipes are unusual and experimental.. loving them a lot... your blog is inspiring me to try the old recipes with new angles,and unusual additions.. specially this guar dhokli ki sabzi.. never thought if such thing existed.. I need you to answer my two queries please.. first, I don't know what guar is? we are used to barboti (bora) and regular beans.. and in USA we don't get bora also.. will this recipe tastes good with regular beans? please tell.. i dying to try this recipe... secondly, i came across your comments in some other blog about how to make mungori.. you mentioned about using microwave in making them? 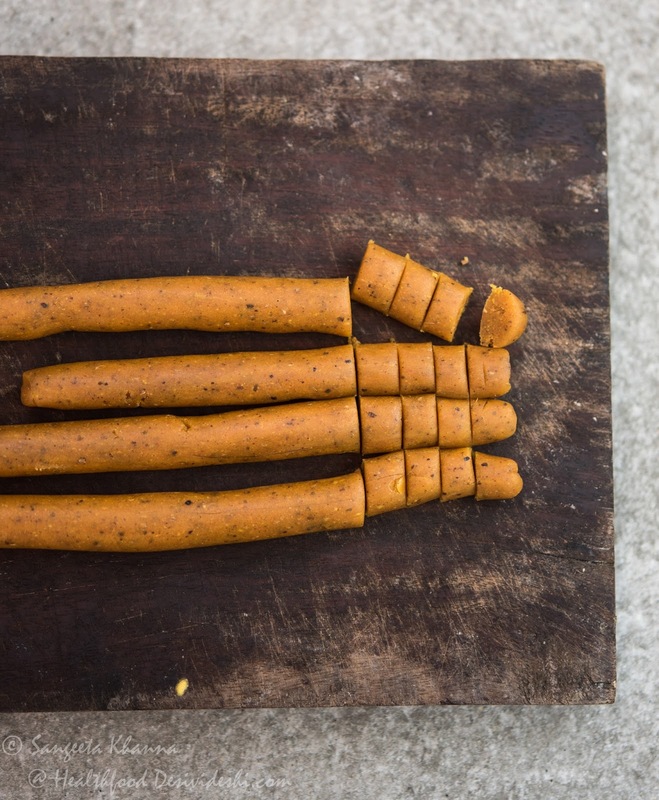 Can you please share your process of making mungori? I also want to make them in microwave. Thanks. Keep going. 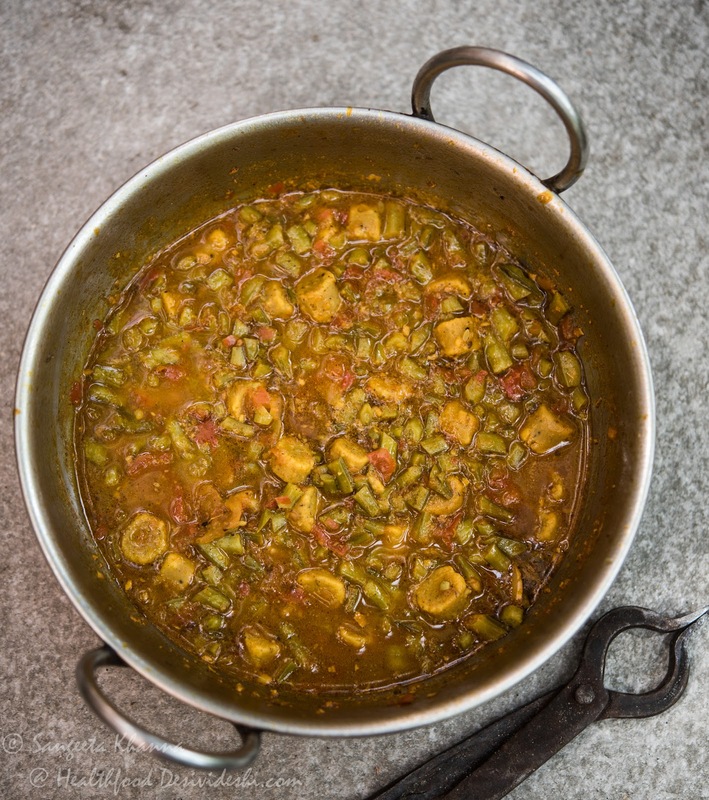 Hi Asha , This guar beans are very different from barbati or any other beans in texture and cooking time (taste to) so this recipe wouldn't be suitable for other beans I think. Guar is also called Gum Guar or cluster beans and are very healthy too. 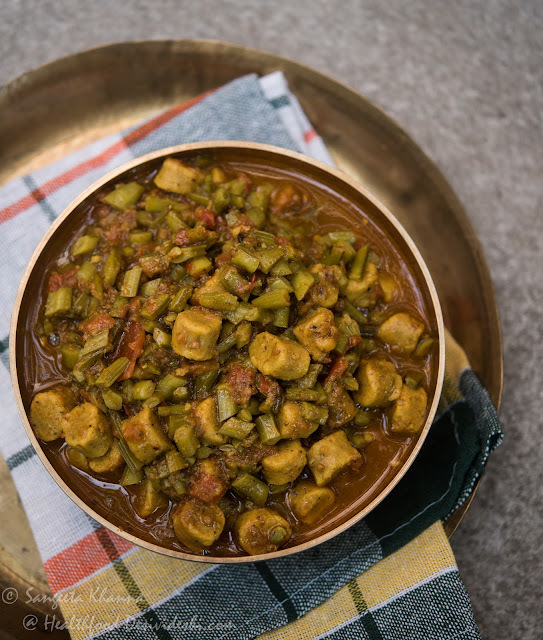 If you want to use other beans you can try some which is firm in texture when cooked for about 10 minutes, the time taken to cook the Dhoklis in this recipe. Some varieties of broad beans can be like that and in your country you get many more varieties of beans. Regarding the mungoris, I will post them sometime when I make them again. Yes they are really easier in the microwave even when needed immediately. Asha, you can "guar" from any Indian store. sometimes they have fresh, and other times not so fresh. depending on where you are in usa, the prices will vary. you can get bora and other indian vegetables from there too. in asian markets, like Ranch 99 (if you are in CA), you could get bora, certain kinds of eggplants, MAYBE karela, fresh lotus roots. Thanks SM , Asha would be glad to know this.